Picking up where the award-winning Stories from a Small Town ends, author Roger Engle continues his journey from adolescence to adulthood in his greatly anticipated sequel. Goodbye Mister Fifteen takes us back to Hedgesville, West Virginia, where a young man on the cusp of his sixteenth birthday eagerly awaits that wallet-sized, laminated ticket to freedom. Mr. Engle brings us along as he advances through high school and college, sharing a collection of stories uniquely his own. Discovering the limits of his newly earned autonomy, and testing the extremes of his automobiles’ performance capabilities, he also begins pushing the invisible boundaries of small-town life. While safety and familiarity are tempting anchors, adventure and opportunity await beyond the town limits, where friendship, music, and love take root. As he explores the wide world of work, he quickly becomes aware of the future ramifications of each decision he is making. A rapidly expanding world ushers in new responsibilities, and for an eighteen-year-old male in the late ’60s, any daydreams of a footloose existence after high school would be quelled by the awaiting geopolitical turmoil of the time. The call to military service awaited most young men, and Mr. Engle was no exception. Carrying a Selective Service card now tempered the excitement his driver’s license once generated. Goodbye Mister Fifteen brings to life with remarkable clarity a progression of eye-opening experiences, revealing both the perceptions and realities of a place and time. 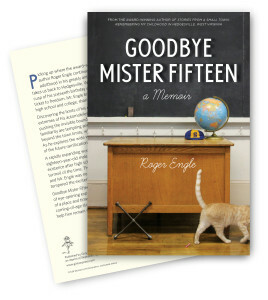 In his matter-of-fact tone, Mr. Engle delivers a unique coming-of-age story where character, humor, and a strong work ethic help him remain steady in the face of an increasingly uncertain future.